Gen Y Women: Is there a gender bias in tech? Technology was once considered a man’s domain, but the tide has shifted: the new generation women across the world have overcome all negative notions and have proved themselves beyond doubt in all spheres of life including the most intricate and cumbersome world of technology. 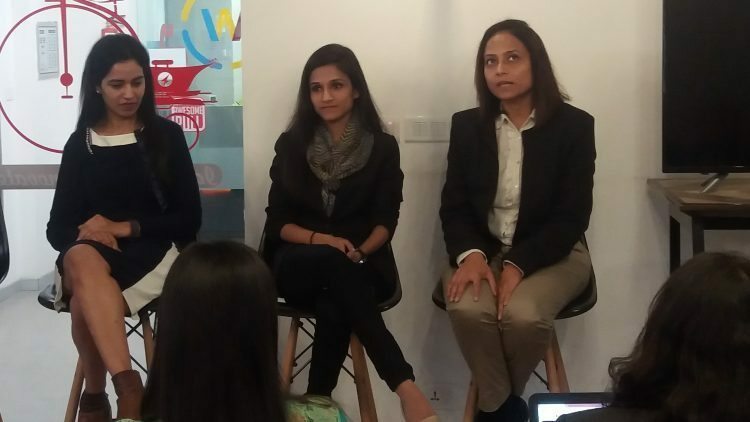 Hence, to understand what has driven this trend so far, Techseen in association with Founder Institute held a talk last Saturday on the topic: Women in Tech: How to Keep Up With Generation Y Women in Tech. While Indian Startups was the Community Partner, AWFIS was the Venue Partner. The key speakers for the event were: Vandana Seth, Co-founder and Director, RV Solutions; Mani Agarwal, Founder, I Wear My Style; and Nandini Rathi, CMO, Betaout. Is there a ‘gender bias’ in tech sector? According to a study by Catalyst, a nonprofit organization working towards accelerating progress for women through workplace, the percentage of women enrolled in specific undergraduate degree programs included 28.5 percent in engineering/technology, 40.2 percent in IT and computer, 35.6 percent in management, and 32 percent in law. This is evidently a good progress, but the fact remains: women still form a minority in the technology sector. Agarwal is of the opinion that landing up in a particular career is just a matter of choice and preference. “The number of women going to engineering colleges or taking up careers related to science, technology, engineering, or mathematics is far less than men. In my opinion, it is more of a gender preference. One reason for fewer women in technology is that a lot of them prefer careers in fashion industry, catering or arts,” she said. Seth believes that gender bias still exists in India. But the new emerging technologies and the startup world has reduced the gender bias to a certain extend. “If you talk about conservative industries like telecom, gender bias still exists there,” said Seth. A study by American Association of University Women (AAUW) suggests that the number of women in science and engineering is growing, yet men continue to outnumber women, especially at the upper levels of these professions. It further adds that in elementary, middle, and high school, girls and boys take math and science courses in roughly equal numbers, and about as many girls as boys leave high school prepared to pursue science and engineering majors in college. Yet fewer women pursue these majors. “Technology needs dedication. Pursuing technology and dropping out of it doesn’t. One has to remain updated constantly with the transformations happening in the technology space. While at schools, science as a subject is necessary for everyone, in colleges it entirely depends upon the inspiration of the girls,” Rathi said. So the good news is that the industry is rapidly changing to create more room for talent by moving beyond the gender gap. According to the speakers, more encouragement to take up engineering and technology courses will automatically escalate the number of women in the industry. “The current startup ecosystem and technology is conducive for women to get into it. There’s nothing that is stopping women. But I think it is just a personal preference when they want to choose a career in arts stream, vis-a-vis an engineering or tech stream,” Agarwal said. Are challenges faced by women entrepreneurs any different? Although, more women are becoming entrepreneurs, they often face a set of challenges not typically shared by their male counterparts. To shed light on some of these disparities, the female entrepreneurs invited by Techseen were asked to share their experiences and challenges women entrepreneurs faced while building their business. “In India, society plays an important role. Parents should groom and encourage their girl child about the sector from the beginning. There are many organizations working on it but we need to do it more often,” said Rathi. All the three speakers were of the opinion that a woman entrepreneur faces exactly the same challenges as any male entrepreneur. Most women are not confronted by the obvious forms of discrimination or sexism. So the assumption that a female has to go through a higher number of roadblocks while setting up her business is a hoax. Is technology a better enabler for businesses? When the attention was drawn to the use of technology as a fundamental business strategy, Rathi explained that vision is more important than the technology itself, and it is with investment and appropriate resourcing that technology gets its true shape. “Picking up technology as a career or a college subject is not a matter of gender bias. Anybody or everybody would pick up the easier part. As for someone who is an entrepreneur and not well versed with technology will either adopt it, adapt to it or hire a technology person,” said Seth. “If I have to understand the consumer behavior, which is the most important thing in running an e-commerce website, I need to resort to technology. It is something that we have to adapt in order to get your hands around things,” said Agarwal. Hence, it can be inferred that technology is an active enabler for many businesses and organizations. But the speakers also pointed out that the digital journey in India is just beginning. The scope for development of technology in homeland still remains to be explored. “We do use technology, but for product development we need a lot of handholding, guidance, and lot of risk taking capabilities,” Seth said. When it comes to Women in Technology, the prevailing question has always revolved around why there aren’t many women in STEM professions and their ability to rise to senior executive and boardroom positions. But the discussion clearly indicated that women are taking a big leap to dissolve this belief. Hence, it’s the VISION, and NOT gender that drives a candid technology.